Purple asparagus is much sweeter and more tender than green asparagus. Thus, it is very suitable for use in salad. Purple asparagus retains its color after brief cooking such as quick sautéing. But it loses its purple and changes to green if subjected to prolonged cooking. Asparagus is delicious, beautiful, packed with nutrients and easy to do ahead for a crowd. One serving of Asparagus is low in calories and very low in sodium. Asparagus is an excellent source of folic acid and is a fairly significant source of Vitamin C, Thiamin, and Vitamin B6. Asparagus contains no fat or cholesterol of dietary significance. It is an important source of potassium and many micronutrients. According to the National Cancer Institute, Asparagus is the highest tested food containing Glutathione, one of the body's most potent cancer fighters. Additionally, Asparagus is high in Rutin, which is valuable in strengthening the blood vessels. The name, asparagus, derived from Greek, means "sprout" or "shoot," and the vegetable belongs to the lily family. Asparagus cultivation began more than 2,000 years ago in the eastern Mediterranean region. Greeks and Romans prized asparagus for its unique flavor, texture and alleged medicinal qualities. They ate it fresh and dried the vegetable to use in the winter. In China, candied asparagus spears remain a special treat. In the 16th Century, asparagus gained popularity in France and England, and early Colonists brought it to America. King Louis XIV of France so enjoyed this delicacy that he ordered special greenhouses built for a year-round supply. Hence the reference to asparagus as "Food of the Kings." 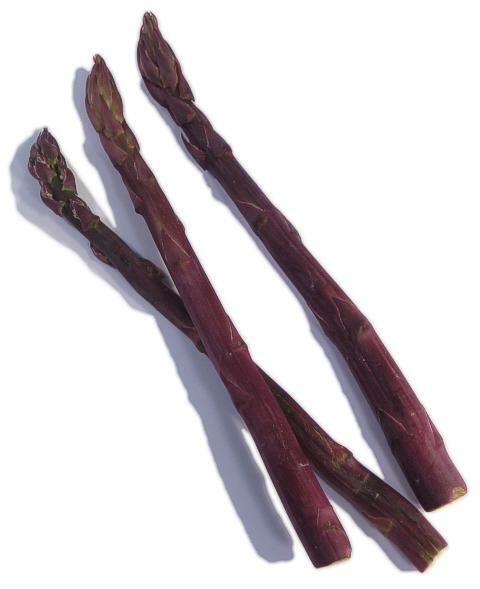 Purple asparagus originated from a region around Albenga, Italy. This "cultivar" is known as Violetto d/Albenga. Although the spears are of deep purple color, the ferns are actually green. The farmers in Albenga region propagate the plants using seeds from open pollination. Seeds are usually collected from vigorous female plants producing large spears.